﻿ Goose liver paste 180g - Szegedi Paprika Zrt. 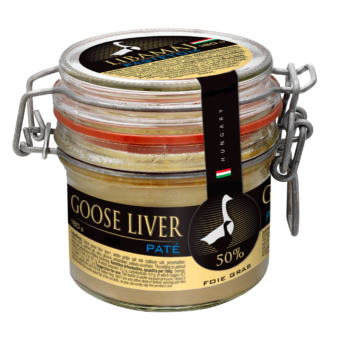 Fatted goose liver 50%*, milk, chicken liver, goose fat, egg, soya protein concentrate, culinary salt, nitrite pickle salt mix (culinary salt, preservative: sodium-nitrit), spice mix (flavour enhancer: sodium-glutamate), antioxidant: E385. Best before: 1,5 years after production date.